Last fall Genevieve Hummel (AMAT 3rd year) learned that her friend, an Illinois Tech student, would have to leave the university because his father was considering bankruptcy. Hummel says that her classmate attempted a university aid appeal but was told that no funding was available. It gave Hummel, a University Scholar, an idea to propose to her fellow students on the Student Gift Committee. 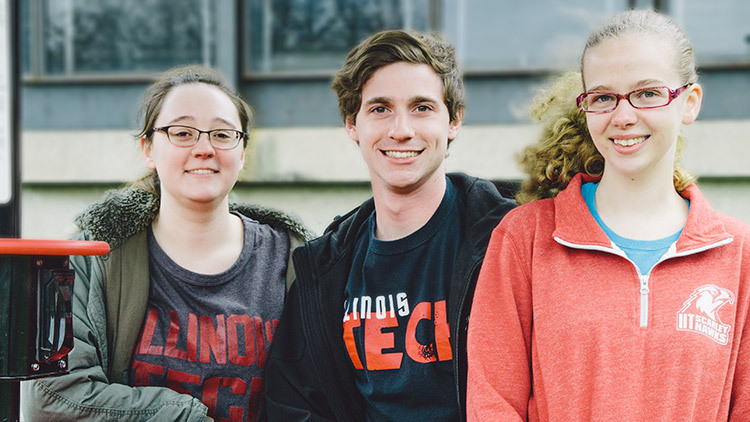 The group liked Hummel’s idea and the aptly named Hawks 4 Hawks Hardship Fund launched last November on Giving Day, a 24-hour event that connects alumni to giving opportunities at Illinois Tech. By the end of the spring 2017 semester, Hawks 4 Hawks raised $20,000. At $2,500 per gift allotment, eight full-time students received assistance. In addition to student donors, this year’s committee was able to garner support from alumni board members, parents, faculty, and staff, making it possible for more students to receive assistance from the fund.